This Stoves Two Turn replacement fan oven element is suitable for many duel fuel and electric Stoves models including those listed. If you cannot see your corresponding model then please contact us with your serial number and we can verify the parts suitability. If you cannot see the element you are looking for please contact us with model details and requirements. 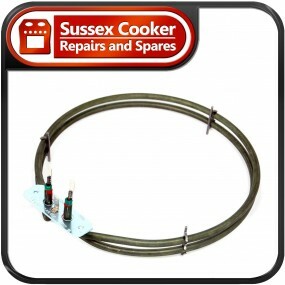 If you have a fan assisted oven that seems to be operating normally but is no longer heating up then it will normally be the fan oven element that is faulty. Before you work on the oven ensure that the power to device is off by locating and switching off the isolator switch. Normally found near to the appliance on the wall. In most Fan Ovens, the element can be accessed by removing the back plate from the rear of the oven by locating and removing the four or five screws. To ensure easy access to the back plate, we advise you unlatch the door and remove all the shelves from the oven bay. Once the back plate is removed, there will normally be four to five screws holding the element in place. Remove these screws and pull the element forward, as you do the wires will also be pulled through the body of the oven. Take care to remove this wires and ensure they don’t drop into the back of the oven. In the event the do you will need to access the rear of the oven in order to recover the wires. It recommended that before disconnecting the wires, you take a visual photo of them so you can reconnect the new element correctly. With the element removed, you can normally identify a visual defect in the element, this usually comes in form of a hole or burnt out section of the element. You may also find a film of white powder coating the surfaces which is safe to clean away. When search for replacement, there number of key indicators which you can compare to ensure you have the correct part. These are, the number of turns or coils in the element, where the main fixing brackets are, and weather the element is pre-fitted with one or two pre-threaded bolts.